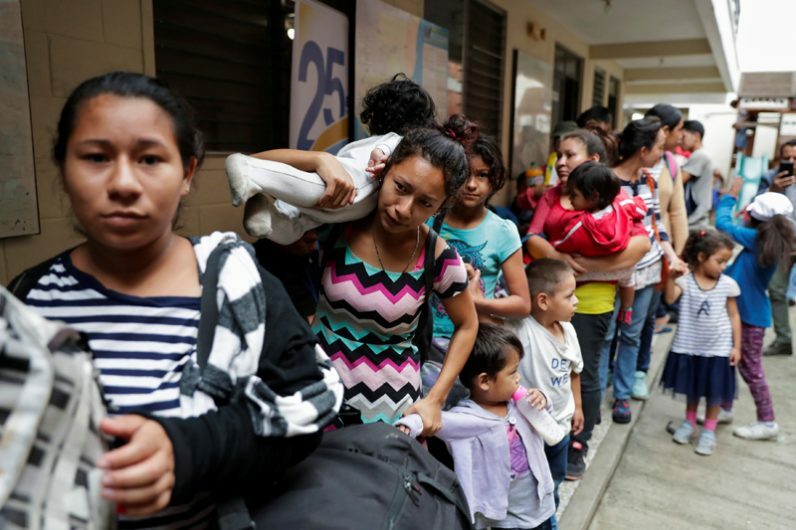 MEXICO CITY (CNS) — A Scalabrini migrant shelter in Guatemala City has served 1,700 Hondurans heading north as part of a caravan seeking to reach the U.S. border. 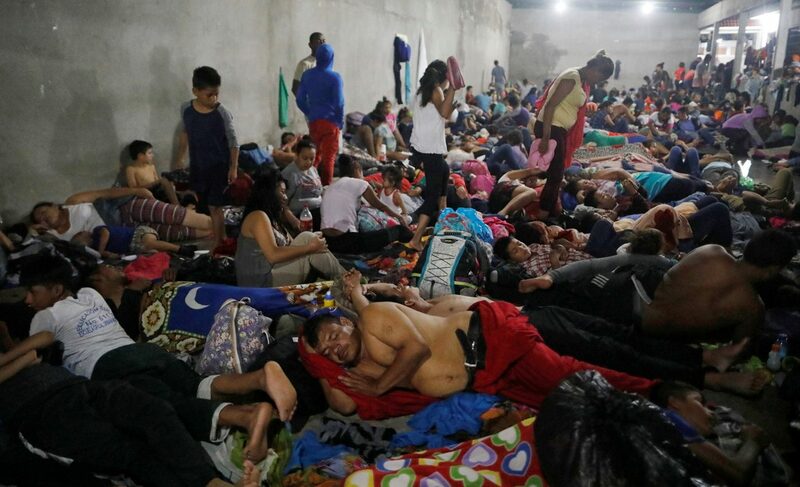 Carlos Lopez, a shelter official, told Catholic News Service the Scalabrini facility in Guatemala normally serves up to 80 guests at a time, but the number of migrants arriving from Honduras has forced the shelter to offer lodging in a nearby school. Resources, he added, are strained and “staff are exhausted,” having worked 48 hours nonstop. Rain is also making life miserable for migrants traveling mostly on foot and sometimes forced to sleep outside. A caravan of Hondurans departed the city of San Pedro Sula Oct. 13, but its ranks swelled as it crossed into Guatemala. Lopez said no one was certain of the caravan’s exact size, but he compared it to a “snowball going downhill” and estimated it at more than 5,000 participants. “This is a humanitarian crisis. Here there are 75-year-old elderly women and 2-month-old babies,” he said. The caravan has captured the attention of U.S. President Donald Trump, who threatened to cut off assistance to Guatemala and Honduras — $1.1 billion in 2017 and 2018, according to the Washington Office on Latin America — if the caravan proceeded. Guatemala issued a statement saying it would stop the caravan, even though Central American countries allow each other’s citizens to cross borders freely. Mexico sent two planeloads of federal police officers to its southern border Oct. 15 as the first migrants in the caravan arrived in the area. The country’s foreign ministry said in a statement anyone with the proper papers could enter Mexico, while those planning to apply for asylum could do so. Anyone not meeting the entry requirements would be turned back, however. The northern triangle of Central America — Honduras, Guatemala, and El Salvador — is one of the most violent regions in the world, though murder rates have declined in recent years. 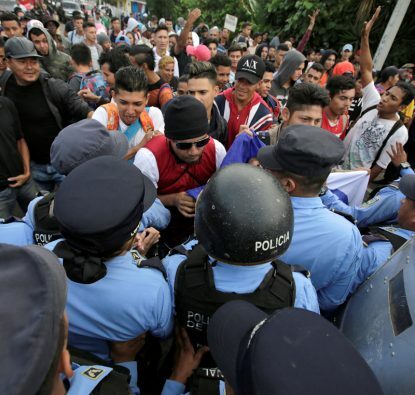 Nicaragua has also experienced an outflow due to political unrest and attacks by police and paramilitaries on the opposition, though many of those migrants head to neighboring Costa Rica. “Poverty, the lack of opportunities, violence and extortion due to gangs … (people) can no longer live with such anxiety and, hence, are taking these actions,” Lopez said. In 2017, nearly 299,000 Central Americans were considered refugees or applied for asylum, according to the Jesuit Network with Migrants — Central America and North America. “The daily crisis of subsistence … derived from the imposition of authoritarian political systems and economic models, which exclude, force people to flee their countries to have a dignified life and sometimes save their lives,” the network said in a statement Oct. 17.